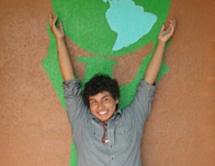 Rudy Sanchez is a youth leader, speaker and environmental advocate. As a senior at Environmental Charter High School, Rudy spent his first couple years of secondary education as the shy student that hid quietly in the back of the classroom and considered environmentalism to be little more than complaints about dying polar bears and melting ice caps. That all changed when he took the Green Ambassador environmental leadership course. Instead of focusing on the negative, this course illuminated solutions and helped him see that youth could lead the change. After realizing that if anyone was going to make a difference, it was going to have to begin with him, he got more involved in the Green Ambassadors class and helped start and lead the Rise Above Plastics Youth Speaker Program — a partnership between Green Ambassadors and Surfrider Foundation. Not only was Rudy speaking passionately about sustainability, but he was leading his peers to do the same. He has helped train more than 60 youth to share their voice about educating and spreading a message to one’s peers and community. With each presentation and training, Rudy is creating a network of solutions so that everyone can be responsible for spreading solutions to their friends, family, and peers. Rise Above Plastics has only opened up countless opportunities. He has helped green the economy with Green My Parents, been trained for green jobs with the National Hispanic Environmental Council, helped green the Paramount Studio lot, and spoke at the International Plastics are Forever Youth Summit. Rudy’s ultimate goal is to empower lower-income communities with the practices of sustainability. He wants to make the green movement embedded deep into communities and everyday life. He wants to see healthy food available for all, clean air a standard in every community, and education using nature as a teaching tool.